Writing a novel, research paper, script or any long-form text involves more than hammering away at the keys until you’re done. Collecting research, ordering fragmented ideas, shuffling index cards in search of that elusive structure—most writing software is fired up only after much of the hard work is done. Enter Scrivener: a word processor and project management tool that stays with you from that first, unformed idea all the way through to the final draft. Outline and structure your ideas, take notes, view research alongside your writing and compose the constituent pieces of your text in isolation or in context. Scrivener won't tell you how to write—it just makes all the tools you have scattered around your desk available in one application. 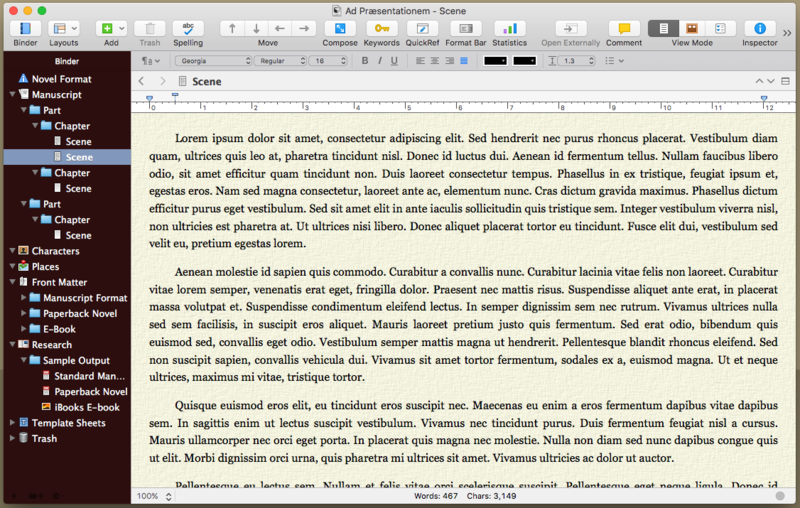 I've been using Scrivener for a few years now, since back when it was a Mac-only application. I was looking for an MS Word alternative because the port to Mac for MS Word was slow and lumbering. 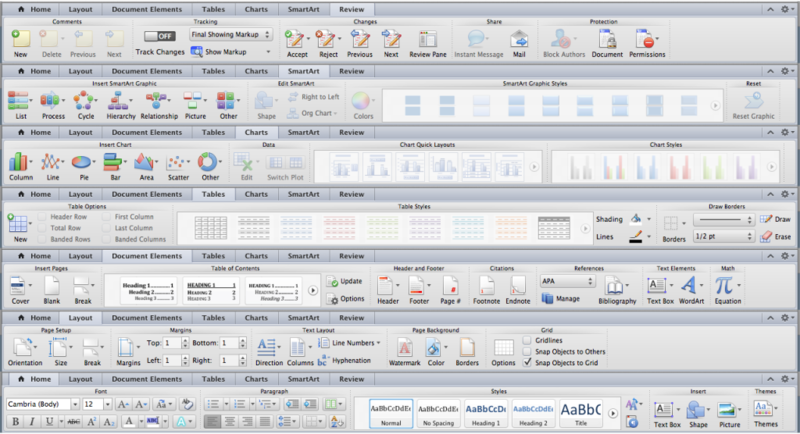 Scrivener turned out to be more than just an alternative. It's a clean, elegant platform that offers everything I need without wasting space and processor speed on anything that I don't. The application is now available for OSX, Windows, and there is even a beta for Linux users! You pay for all of that and touch next to none of it in the creation of a manuscript. I'll let you do the math. Instead of all those "bells & whistles", you get a clean, dedicated word processor created for you, the writer, where you can manage your work in a way designed with you in mind. Where other word processors become unwieldy and slow, trying to be jack of all trades, Scrivener is devoted to just one thing: The creation of a manuscript. You can set your workspace to your liking. Font, font size, background color, all of this can be set to what works best for you on-screen, and has no effect at all on the professional end manuscript format that Scrivener compiles for you. If you're a planner, Scrivener will be a pleasure, allowing you to handle your novel as an outline, keeping track of chapters and scenes that can be easily moved and shifted if you find a scene needs to come earlier or later, dividing and joining with ease. If your project is research intensive, Scrivener will house almost any file type you can throw at it, keeping everything in a Research area within your project. Everything at your fingertips, all in one place. I really can't say enough about this application. Scrivener offers a 30 day, full function trial. Not one of those beta trials where only half the features work. Plenty of time to decide if it's right for you. P.S. Scrivener 2.7 has just been released giving full compatibility with the new features in OSX 10.11 El Capitan and also integration with the long-anticipated mobile version of Scrivener! ladybird and Tea@3 like this. I feel like a painter holding her first set of lush brushes. I hope I don't cry about it, bit embarrassing. With Microsoft Word, it was always difficult for me to have a scene in mind that I wanted to write about, yet feel the need to write all of the scenes before the one I was most ready to write because it would've been hard for me to find my place if I tried writing my scenes in any order other than strict beginning-to-end, only for the scene that I had originally been energized about to then become a scene that I had to slog through because I'd lost my momentum having to get to it in the order that a reader would've gotten to it. With Scrivener, I can work on any section of my story and still be just a click or two away from any other section, so I can write in whichever section I have material to write about when I have the most energy to write that specific material. When I wrote my Doctor Who fanfic on Microsoft Word, it took me about two and a half years to write 63k words. I've only been using Scrivener for about two and a half weeks, but I've already added over 4k words into my new original novel because I'm no longer constrained by having to write linearly. 7.5 out of 5 stars. I'm using it. Very, very good. The ability to write a synopsis on each text file is the most important thing for me, I have a great control of what is going on in my text with it and the corkboard view. I've tried some other programs before, and no one allows me to work with easy and complete control of the text like Scrivener. Until finding this Resource, I had never heard of Scrivener. Okay, I had seen the Community Sponsor ad on the Board, but never thought much of it. Now, after reading what Wreybies said I went to check it out. From what I have seen so far it seems like a must-have when working with extensive writing projects (at least in my eyes). A really valuable reasource I can't wait to try! 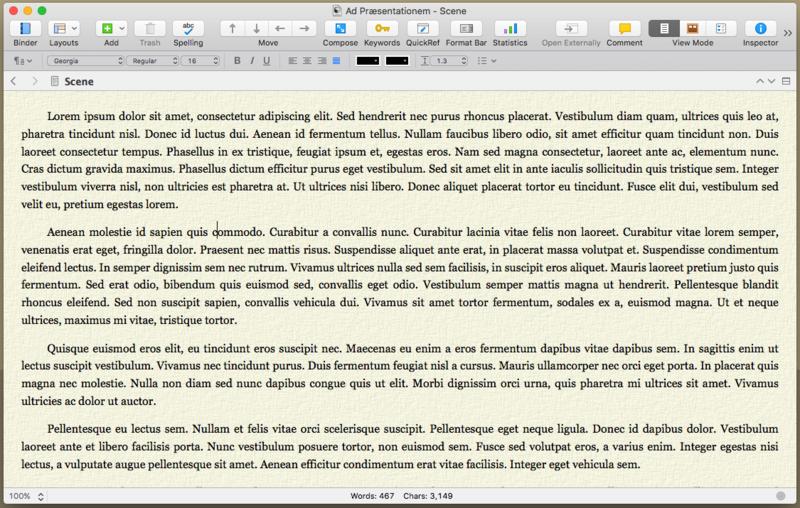 A week after starting to use Scrivener I put it on my wish list. If it wasn't for the fact that it's my birthday when the trial runs out I'd already have bought it myself. As obsidian_cicatrix said: "It's that good. Try it, and see for yourself." This program makes me wonder how I ever did without it. The management system is invaluable—each project can be tailored to suit specific needs. It keeps everything visble and close at hand. I originally downloaded a trial, unsure whether I would benefit from its use, and ended up purchasing it before the trial was up—It's that good. Try it, and see for yourself.